The buildings occupy a prominent position in the area, with wide open vistas over Töölönlahti bay. The exterior is characterized by a grid of openings slightly altered from that of the adjacent EY office building. Spiralling white stairs cut skylighted voids in the buildings. Curving walls and high-quality materials provide a unique entrance to the apartments. Room-height windows and large balconies frame views of the surrounding park and monuments. Töölönlahti area is a new developement adjacent to Helsinki main railway station. Located on a prominent site opposite to Alvar Aalto’s Finlandia Hall, the two apartment buildings occupy the northernmost position in the area, with wide open vistas of Töölönlahti bay. The subtle folding of the facades gives the buildings a timeless, yet sculptural appearance. The exterior is characterized by a grid of openings slightly altered from that of the adjacent EY office building. 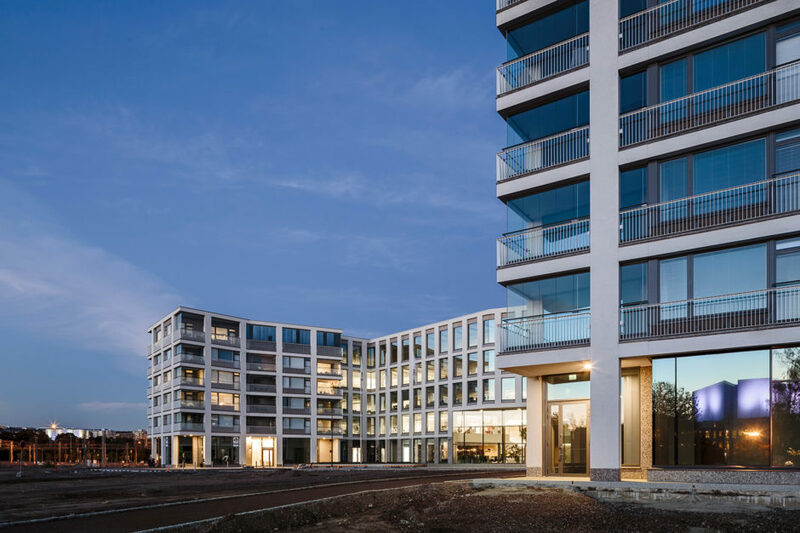 The more horizontal facade division distinguishes the apartments from the office building while maintaining the integrated appearance of the quarter. Observed from a closer distance, the plain grid and steel railings of the facade string together the diverse balconies, terraces and windows, giving the buildings a sense of confidence and individuality. The changing depth of the facade creates a play of light and shadow on the surfaces clad with grey stone, white plaster and wood. The stairways are defined by curved walls, cutting spiralling and skylighted voids in the hearts of the buildings. Room-height window openings and large balconies offer framed views out to the Finlandia Park, city centre and the monuments nearby. adjacent to EY office building.